Can your dog take a seat on a King County Metro bus? Yes, but here are the rules. 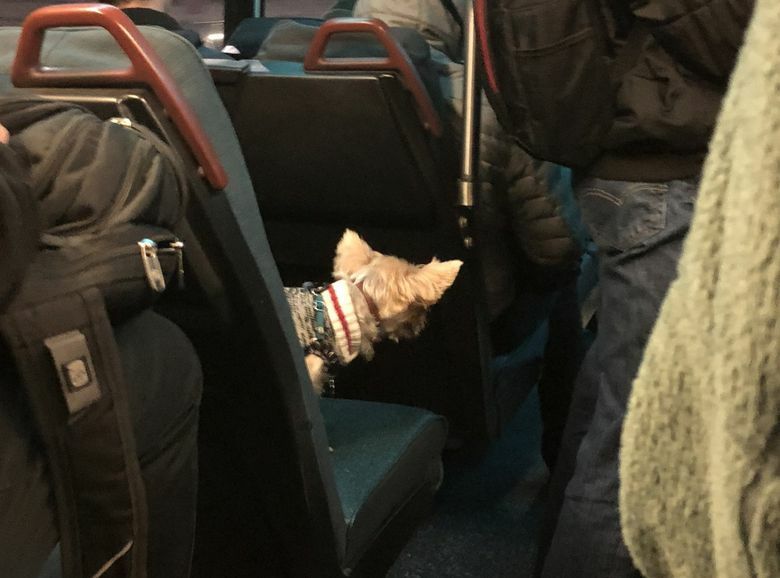 As riders glared and stood in the aisle, a tiny terrier kept its own seat beside its owner on a crowded Metro bus in Seattle. Is that allowed? What are the rules on dogs, anyway? On a crowded rush-hour bus, I saw several Seattle stereotypes come together in the form of an adorable Yorkshire terrier wearing a sweater. The dog’s owner and I had gotten on the bus on the same stop, along with another rider accompanied by a black lab on a leash. The owner held the tiny dog in her arms when we got on the not-yet-crowded bus, then gently set her down in her own seat. But as we got closer to Amazonia, I realized there might be a problem. Dozens of blue-badge-wearing employees got on, filling every seat. And the dog was still sitting on one. Riders stood in the aisle, glaring, but no one said anything. Seattle: Obsessed with dogs, afraid of conflict. I observe at least one pooch on every bus I ride, and a growing number when I’m near Amazon offices, which allow thousands of dogs to come to work with their humans. But what exactly are the rules about dogs on Seattle buses? No one I asked seemed to know all the ins and outs. The quick answer, straight from King County Metro: Yes, dogs are allowed on Metro buses. But a driver can refuse to let the rider and dog on board if he or she thinks there will be a problem. Lap dogs ride for free; larger, non-service dogs are subject to a base fare. Service animals for people with disabilities are always allowed (unless his or her behavior threatens passengers’ safety) and ride for free, Metro says. A driver may ask the rider if their dog is a service animal, spokesman Scott Gutierrez said, but the rider doesn’t need to provide proof. The dogs have to stay on the floor without blocking the aisle, or sit on their owner’s lap. Service dogs can sit in a seat, if there’s one available. Service dogs are specifically trained to perform certain duties, so emotional-support, therapy or comfort dogs aren’t classified as service dogs. For non-service dogs, the rules are a bit more stringent. They need to always be on a leash and must stay on the floor or in their owner’s lap. Riders whose dogs can’t sit on their lap have to pay two fares: One for themselves and one for their dog. Yes, you can buy an ORCA card for your dog, like Eclipse the black lab-gold mastiff mix who became famous for riding the D-Line by herself with an ORCA card attached to her collar. Or you can use one card but tell the driver you’re paying for two passengers. ORCA cards and cash are accepted, Gutierrez said. Dog biscuits are not. As for that adorable Yorkie?